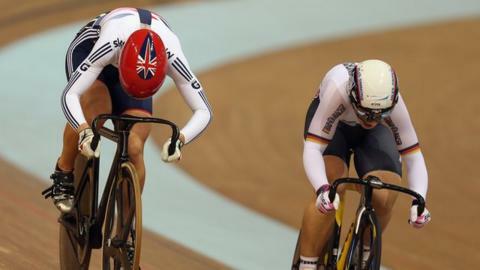 Shane Sutton says Britain's track cyclists are "heading to greatness" at the 2016 Rio Olympics after topping the medal table at the World Championships. A youthful team won nine medals from 19 events in Belarus, five of them gold. Head coach Sutton said: "If you look at where we were at the beginning of the last Olympic cycle, we are in a much stronger position. "You can virtually name your team for Rio now. I think this team is heading towards greatness in three years." In 2009, Britain followed the 2008 Beijing Olympics with nine medals at the World Championships in Poland, but only two were gold. This time around, their 16-strong squad included six senior world debutants and eight riders aged 20 or younger. Becky James, 21, was the star of the show, winning the sprint and keirin titles, as well as bronze medals in the team sprint and 500m time trial. But three other young riders marked their first appearances at this level with medals. Simon Yates, 20, won the men's points race, 18-year-old Cardiff A-level student Elinor Barker was part of the triumphant women's team pursuit squad and Vicky Williamson, 19, joined James on the podium in the team sprint. "They are joined already as a team," added Sutton. "They are a very young squad and they all get on. They are all around the same age. "It is quite exciting from my point of view - and Dave Brailsford (the performance director of British Cycling) - to see us come here and perform with this particular squad." Legends like Victoria Pendleton and Sir Chris Hoy were absent in Belarus. Pendleton retired after the London Olympics, while Hoy is on a sabbatical from the sport. But other key figures from the Olympics were missing, too, with the likes of Jo Rowsell, Geraint Thomas and Peter Kennaugh focusing on their road racing careers. Despite Rowsell's absence, the women's team pursuit squad continued their dominance of the event in Belarus. Barker slotted seamlessly into the line-up to help the Olympic champions take a fifth world title in the six-year history of the event, which now expands from three riders over 3km or 12 laps of the velodrome to four riders over 4km and 16 laps. In the men's event, Britain took silver but were well beaten by Australia in the final. Their disappointing performance was put down in part to Ed Clancy's dalliance with the team sprint over the last few months. Sutton says Clancy was missed because they "needed that animal in there hurting the others in training and leading the way" and cannot see him returning to the team sprint in the future. Becky's success will put her in the spotlight so my advice would be "don't let those rainbow stripes (on the world champion's jersey) weigh heavy on your shoulders" because I found it really hard to race the next season feeling all eyes were on me. There will also be the pressure from herself because when you've done it once, you don't want to give those jerseys back, you don't want to see someone else wearing it the following year. The team pursuit line-up could evolve before the next Olympics, however. Last year's Tour de France winner Bradley Wiggins, who has won a medal of each colour in this event in three different Olympics, has been linked with a return to the squad in time for Rio. "I think we would have to be very careful," said Sutton. "In Bradley's case, there has always been a possibility, but the longer time goes on and he puts another couple of Tours in his legs, then it would be a big call for him." World road race champion and sprint star Mark Cavendish has also indicated he might return to the track, while Thomas took a year off from road racing to compete at the 2012 Olympics. "I don't know if Mark is still talking about doing that but, put it this way, we would not be kicking him out of the velodrome as he walked in," Sutton said. "It would be nice to see him. "But, as far as I am concerned, if Geraint comes back and can ride team pursuit in four years' time then we are not doing our jobs. "What you have got to remember is that we took a season out of Thomas's pro career to win that gold medal in London, which is a lot to ask of a big rider. In three years' time, the chances of him coming back are minimal." But Sutton thinks Kennaugh could make a return. "His hunger is there for the track but he would need to come in and give it a full year's commitment for the Olympics, just like Geraint did," said Sutton.